Painting cabinets is a no-brainer for a cost-effective bathroom revival project. Given the steep price of new cabinets, even homeowners who detest painting start to entertain the thought given giant estimates for replacements. But before you start combing through color samples, be aware that this project can easily take a couple of weekends, and often more (it seems a lot faster on TV, of course). If you're willing to take your time to do it right, a new paint job will last for years and will look just like you envisioned. There are two types of paint that you can use for this job: water-based and oil-based. Oil-based paint dries to a durable finish that works well in high-traffic areas and is less likely to show brushstrokes than water-based paint. However, oil-based paint takes longer to dry, and painting equipment must be cleaned up with chemical solvents. Oil-based paint should be applied in an extremely well-ventilated area. Water-based paint dries quickly and can be cleaned up with water. Use a semi-gloss, satin or gloss paint; these are durable and easy to clean. For durability and quality, look for a 100-percent acrylic enamel formula. For a more dramatic makeover, consider replacing all of the hardware during the project to give your cabinets a truly updated appearance. Remove all objects from the cabinets and drawers. Spread drop cloths around the work area to prevent getting paint on your floors. Apply painter's tape to any surface (such as countertops where they join the cabinets) that you don’t want to get paint on. Place a small piece of painter's tape on the interior of each cabinet door and drawer. Number each piece or identify it in a way that will help you remember which cabinet it belongs to. Use a screwdriver or drill to remove the doors and hinges from the cabinets. Remove the drawers, then remove the drawer fronts from the drawer boxes, if possible; otherwise, level the fronts attached and mask off the boxes. Remove all knobs and pulls from the cabinet doors and drawers. Clean the outside surfaces of the cabinet boxes and the doors and drawer fronts with TSP or a less-toxic TSP substitute to remove all grease and grime. If you're painting the cabinet interiors (which is optional), clean those as well. Inspect the cabinet boxes, doors, and drawers for nicks and dings. Use a putty knife and wood putty to repair any damage. Smooth the putty with the knife and allow it to dry, then sand it smooth. 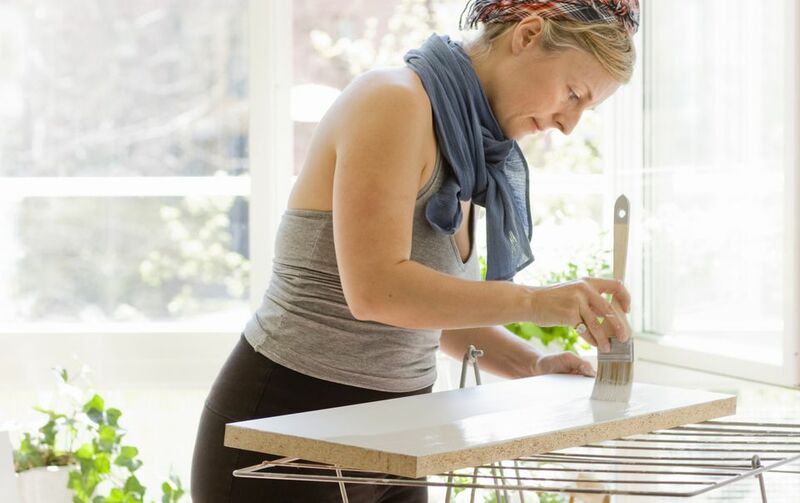 Lightly sand the outside of the cabinets as well as the doors and drawer fronts, using 150-grit sandpaper. This will help the primer and paint adhere to the surface. Wipe down the surfaces with a damp cloth to remove dust. For a really clean surface, use a tack cloth. Apply an even coat of primer to the exposed surfaces of the cabinet boxes and all of the doors and drawer fronts, using a sprayer, roller, or brush. A sprayer, which you can rent at some hardware stores, works best for this job. If you use a brush, paint with long, smooth, even motions so the brushstrokes are not visible. Don't forget to paint the edges of the cabinet doors. Allow the primer to dry completely, as directed by the manufacturer. Apply the first coat of paint to doors, drawer fronts, and cabinet boxes. If you are using water-based paint, use a synthetic paintbrush or a sprayer. Oil-based paints require a natural-bristle brush or a sprayer. Don't forget to paint both sides of the doors; it's usually easiest to allow the front to dry before painting the back. Allow the paint to dry as directed. Apply a second coat of paint to all surfaces and allow it to dry for 24 hours or, preferably, for the full cure time specified by the manufacturer; this may be one week or more, but it allows the finish to harden before the cabinets are returned to normal use. Reattach the old hardware or attach the new hardware. Attach the doors to the cabinet boxes, and reattach the drawer fronts to the drawer boxes, if necessary. Slide the drawers back in place. Does Costco Sell Quality Wood Cabinets? Which Comes First: Flooring or Cabinets? Ever Wondered What Kitchen Base Cabinets Are?